3 form under physiological conditions, while its α-carboxylic acid group is deprotonated −COO− under physiological conditions. Aspartic acid has an acidic side chain (CH2COOH) which reacts with other amino acids, enzymes and proteins in the body. Under physiological conditions (pH 7.4) in proteins the side chain usually occurs as the negatively charged aspartate form, −COO−. It is a non-essential amino acid in humans, meaning the body can synthesize it as needed. It is encoded by all the codons GAU and GAC. D-Aspartate is one of two D-amino acids commonly found in mammals. In proteins aspartate sidechains are often hydrogen bonded to form asx turns or asx motifs, which frequently occur at the N-termini of alpha helices. The L-isomer of Asp is one of the 22 proteinogenic amino acids, i.e., the building blocks of proteins. 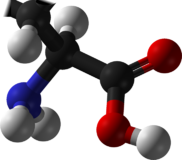 Aspartic acid, like glutamic acid, is classified as an acidic amino acid, with a pKa of 3.9, however in a peptide this is highly dependent on the local environment, and could be as high as 14. Asp is pervasive in biosynthesis. Aspartic acid was first discovered in 1827 by Auguste-Arthur Plisson and Étienne Ossian Henry by hydrolysis of asparagine, which had been isolated from asparagus juice in 1806. Their original method used lead hydroxide, but various other acids or bases are more commonly used instead. There are two forms or enantiomers of aspartic acid. The name “aspartic acid” can refer to either enantiomer or a mixture of two. Of these two forms, only one, “L-aspartic acid”, is directly incorporated into proteins. The biological roles of its counterpart, “D-aspartic acid” are more limited. Where enzymatic synthesis will produce one or the other, most chemical syntheses will produce both forms, “DL-aspartic acid”, known as a racemic mixture. Because Aspartate can be synthesized by the body it is classified as a non-essential amino acid. In the human body, aspartate is most frequently synthesized through the transamination of oxaloacetate. The biosynthesis of aspartate is facilitated by an aminotransferase enzyme: the transfer of an amine group from another molecule such as alanine or glutamine yields aspartate and an alpha-keto acid. Aspartate also plays an important role in the urea cycle. The major disadvantage of the above technique is that equimolar amounts of each enantiomer are made. Using biotechnology it is now possible to use immobilised enzymes to create just one type of enantiomer owing to their stereospecificity. In the urea cycle, aspartate and ammonia donate amino groups leading to the formation of urea. Aspartate has many other biochemical roles. It is a metabolite in the urea cycle and participates in gluconeogenesis. It carries reducing equivalents in the malate-aspartate shuttle, which utilizes the ready interconversion of aspartate and oxaloacetate, which is the oxidized (dehydrogenated) derivative of malic acid. Aspartate donates one nitrogen atom in the biosynthesis of inosine, the precursor to the purine bases. In addition, aspartic acid acts as a hydrogen acceptor in a chain of ATP synthase. 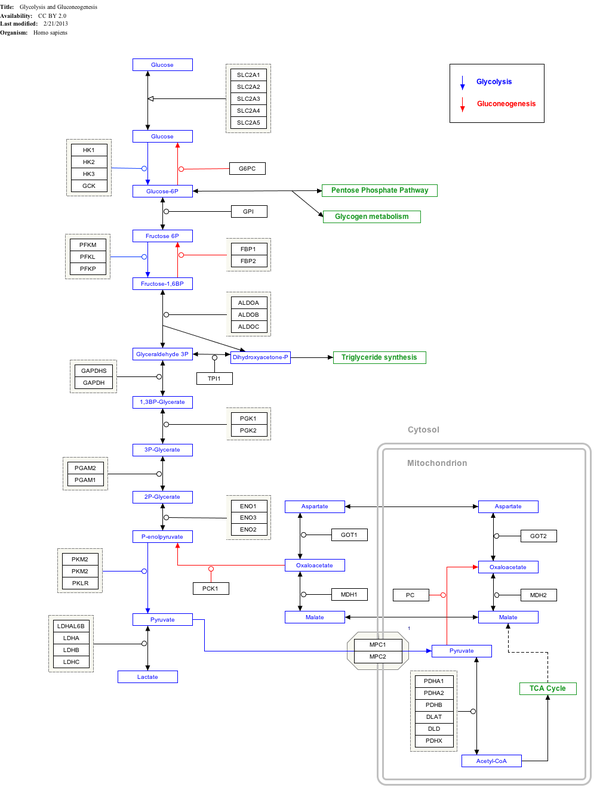 ^ The interactive pathway map can be edited at WikiPathways: “GlycolysisGluconeogenesis_WP534”. Aspartate (the conjugate base of aspartic acid) stimulates NMDA receptors, though not as strongly as the amino acid neurotransmitter L-glutamate does. As of 2014, the global market for aspartic acid is $117MM annually (50-60K MT/Yr) with potential areas of growth accounting for an addressable market[clarification needed] of $8.78BB. The three largest market segments include the U.S., Western Europe, and China. Current applications include biodegradable polymers (polyaspartic acid), low calorie sweeteners (aspartame), scale and corrosion inhibitors, and resins. Nearly all aspartic acid is manufactured in China. One area of aspartic acid market growth is biodegradable superabsorbent polymers (SAP). [improper synthesis?] The superabsorbent polymers market is anticipated to grow at a CAGR[clarification needed] of 5.5% from 2014 to 2019 to reach a value of $8.78BB globally. Around 75% of superabsorbent polymers are used in disposable diapers and an additional 20% is used for adult incontinence and feminine hygiene products. Polyaspartic acid, the polymerization product of aspartic acid, is a biodegradable substitute to polyacrylate. The polyaspartate market comprises a small fraction (est. < 1%) of the total SAP market. In addition to SAP, aspartic acid has applications in the $19B fertilizer industry, where polyaspartate improves water retention and nitrogen uptake; the $1.1B (2020) concrete floor coatings market, where polyaspartic is a low VOC, low energy alternative to traditional epoxy resins; and lastly the >$5B scale and corrosion inhibitors market. Vegetable sources: sprouting seeds, oat flakes, avocado, asparagus, young sugarcane, and molasses from sugar beets. ^ a b “862. Aspartic acid”. The Merck Index (11th ed.). 1989. p. 132. ISBN 978-0-911910-28-5. ^ “ICSC 1439 – L-ASPARTIC ACID”. inchem.org. ^ Haynes, William M., ed. (2016). CRC Handbook of Chemistry and Physics (97th ed.). CRC Press. p. 5–89. ISBN 978-1498754286. ^ “Nomenclature and Symbolism for Amino Acids and Peptides”. IUPAC-IUB Joint Commission on Biochemical Nomenclature. 1983. Archived from the original on 9 October 2008. Retrieved 5 March 2018. ^ a b c d G.,, Voet, Judith; W.,, Pratt, Charlotte (2016-02-29). Fundamentals of biochemistry : life at the molecular level. ISBN 9781118918401. OCLC 910538334. ^ Berzelius JJ, Öngren OG (1839). Traité de chimie (in French). 3. Brussels: A. Wahlen et Cie. p. 81. Retrieved 25 August 2015. ^ Plimmer R (1912) . Plimmer R, Hopkins F (eds.). The chemical composition of the proteins. Monographs on Biochemistry. Part I. Analysis (2nd ed.). London: Longmans, Green and Co. p. 112. Retrieved January 18, 2010. ^ “Nomenclature and symbolism for amino acids and peptides (IUPAC-IUB Recommendations 1983)”, Pure Appl. Chem., 56 (5): 595–624, 1984, doi:10.1351/pac198456050595 . ^ Dunn MS, Smart BW (1950). “DL-Aspartic Acid”. Organic Syntheses. 30: 7. ; Collective Volume, 4, p. 55 . ^ Lehninger AL, Nelson DL, Cox MM (2000). Principles of Biochemistry (3rd ed.). New York: W. H. Freeman. ISBN 1-57259-153-6. ^ Chen PE, Geballe MT, Stansfeld PJ, Johnston AR, Yuan H, Jacob AL, Snyder JP, Traynelis SF, Wyllie DJ (May 2005). “Structural features of the glutamate binding site in recombinant NR1/NR2A N-methyl-D-aspartate receptors determined by site-directed mutagenesis and molecular modeling”. Molecular Pharmacology. 67 (5): 1470–84. doi:10.1124/mol.104.008185. PMID 15703381. ^ Evans J (2014). Commercial Amino Acids. BCC Research. pp. 101–103. ^ a b Transparency Market Research. Superabsorbent polymers market – global industry analysis, size, share, growth, trends and forecase, 2014-2020. (2014). ^ Alford DD, Wheeler AP, Pettigrew CA (1994). “Biodegradation of thermally synthesized polyaspartate”. J Environ Polym Degr. 2: 225–236. ^ Kelling K (2001). Crop Responses to Amisorb in the North Central Region. University of Wisconsin-Madison. ^ Global concrete floor coatings market will be worth US$1.1 bn by 2020. Transparency Market Research (2015). ^ Salunkhe DK, Kadam S (18 August 1995). Handbook of Fruit Science and Technology: Production, Composition, Storage, and Processing. CRC Press. pp. 368–. ISBN 978-0-8247-9643-3. ^ Considine DM (6 December 2012). Foods and Food Production Encyclopedia. Springer Science & Business Media. pp. 114–. ISBN 978-1-4684-8511-0. American Chemical Society (21 April 2010). “Ancestral Eve’ Crystal May Explain Origin of Life’s Left-Handedness”. ScienceDaily. Archived from the original on 23 April 2010. Retrieved 2010-04-21.